Happy Monday! Here is a very simple card to share with you today. 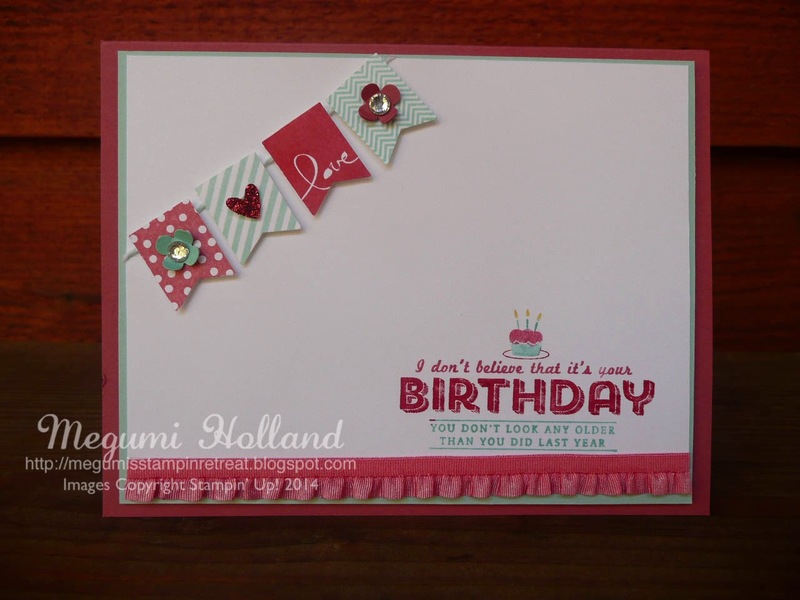 I'm loving the new Banner Blast Stamp Set and the Banner Punch from the Sale-A-Bration Catalog. I embellished my banners with some flowers using the Itty Bitty Shapes Punch Pack and a cute heart from the Owl Builder Punch. The birthday image is See Ya Later Stamp Set from the Sale-A-Bration Catalog. If you are not familiar with our Sale-A-Bration promotion, it's Stampin' Up! 's biggest promotion of the year. Every $50 you spend before shipping and tax, you earn one FREE product from the Sale-A-Bration Catalog. The promotion is available until March 31, 2014. Click HERE to browse the Sale-A-Bration Catalog.